This potent mind and memory tonic is recognised by the World Health Organization as a living fossil, its direct relatives having existed over 270 million years ago. It has been revered in the East for well over 3000 years, and Western science has since proven its beneficial effects on the memory and general brain function by increasing blood flow through the brain. Extracts of Ginkgo Biloba leaves contain flavonoid glycosides and terpenoids (ginkgolides and bilobalides). Clinical trials have shown Ginkgo Biloba to be effective in treating mild dementia, although it is mainly used as memory and concentration enhancer, and anti-vertigo agent. 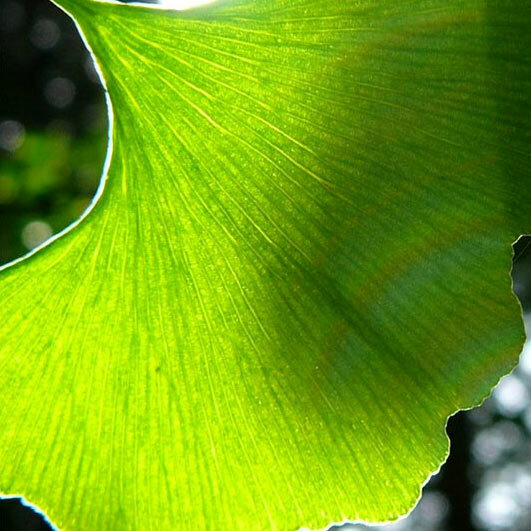 According to some studies Ginkgo Bilobacan significantly improve attention in healthy individuals. In one such study, the effect was almost immediate and reaches its peak in 2.5 hours after the intake. This has led to Ginkgo Biloba becoming a popular supplement for those taken exams or who need a prolonged mental boost in their work or leisure activities. Ginkgoimproves blood flow through the body (including microcirculation in small capillaries) to most tissues and organs; it also protects against oxidative cell damage from free radicals due to its anti-oxidant effects. The World Health Organization reports that the medicinal uses of Ginkgo Biloba that are supported by clinical data include treatment of the effects mild to moderate cerebrovascular insufficiency (blood flow to the brain) as well as the effects of peripheral arterial occlusive diseases, which may manifest as memory deficit, disturbed concentration or headaches. Take one to two pills around 2 hours before increased concentration or mentation effects are required, with or without food, with water. Do not exceed the stated dose. Ginkgo Biloba inhibits monoamine oxidase (i.e. is a mono-amine oxidase inhibitor, a MAOI), and therefore should not be used by people who are taking certain types of antidepressants (monoamine oxidase inhibitors and selective serotonin re-uptake inhibitors) or by pregnant women, without first consulting a doctor. Also consult your physician if suffering from a blood circulation disorder or if taking anticoagulants such as ibuprofen, aspirin, or warfarin. Based on a single daily capsule, a 30 capsule pack would last for 1 month.